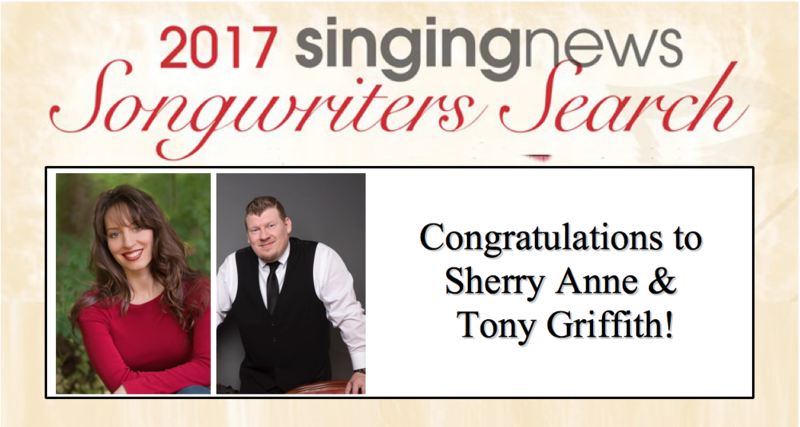 Sherry Anne and Tony Griffith have added some new accolades to their credit, this time rounding out 2017 with winning the Singing News Songwriter Search. Sherry and Tony collaborated on the song “You Came”, while they were working on Sherry Anne’s Christmas album, ‘Merry Christmas With Love’ in 2015. The song will be recorded by The Hyssongs on a future album. As an artist, Sherry Anne, has had several Singing News chart singles, been a two-time nominee for the Singing News Favorite New Artist award, and made appearances on television and popular stages such as Dollywood and The National Quartet Convention. She has also shared the stage with Bill Gaither & The Gaither Vocal Band, The Hoppers, The Booth Brothers, Triumphant Quartet and many others. Tony has experienced success with his family group, The Griffith Family, with multiple Singing News charting singles, appearances on national television, and hitting the stage at the National Quartet Convention and Dollywood. His producing credits also include co-producing the ‘Christmas With T. Graham Brown’ album which had a successful run in the Cracker Barrel stores nationwide. Congratulations to both for the songwriting accolade!